Click on the questions below to see our answers. Enjoy! A small Interior Design firm in Utah- I literally searched the phone book for any kind of interior designer that I could find since they were few and far between in the town I was living in. It was definitely a challenge since my boss' style was quite different from mine but such a great experience- learning the ins and outs of running a project/design business; reading plans, drawing layouts, selecting materials, working with tradesmen, understanding client relationships, etc. What were you doing before you launched Caitlin Wilson Design? What was it like to take the leap and begin your own business? I was working at another firm in Salt Lake City and also designing displays for a local boutique. My first two clients found me- one at the boutique I worked at and the other through my personal blog. I was so ready to work on my own that I didn't even hesitate when they asked if I could help them with their homes! I would work on the projects at night but after just a month of juggling 3 jobs, I was too busy to handle my workload at the firm and my new clients so I took the leap and started Caitlin Wilson Design. Leaving the 9-5 office job was liberating and I was so thrilled to be able to control my own projects and create unique, beautiful spaces for my clients. When we found out that we would be moving to Hong Kong for 6 months- it seemed like the perfect opportunity to explore the idea of textile design. I went to the fabric district and physically walked from door to door asking if anyone could print small sample batches of patterns I had thought up. One thing led to another and I eventually found a source that would work with me on a small scale since typically ordering overseas means massive quantities and often poor quality. Simultaneously, I met a friend at church who had studied textile design and could help me translate my ideas into real patterns. It was an absolute kismet…we worked for 6 straight months drawing, designing, sampling, before we finally placed a large order of fabric by the yard that I planned to sell online once I moved back to the US. The biggest challenge working the manufacturers is their lack of attention to detail and quality control. I opted just have the fabrics made in Hong Kong and have all the sewing done right here in Pennsylvania. That way I can ensure that every pillow and pattern match up and meet the high quality that I expect for my clients pillows. We love how you incorporate high-end pieces and great bargain finds into your room designs for someone looking to design her personal space, which home accessories do you recommend splurging on, and which accessories should you save? I say splurge on fabric and pillows that will make your space come to life with pattern and color- I often achieve that with patterns that incorporate multiple colors and tie together different elements in a room. Find bargain lamps at local stores, rugs online, and quirky accessories at inexpensive antique or vintage stores. I wish I had could say that had a calculated media strategy but I'll admit that most of the great press exposure just came to me- it was and still is incredibly flattering every time I am featured in a magazine or blog. When I first launched Caitlin Wilson Textiles, I contacted all of the lovely blogger friends that I had made in recent years, sent out lots of swatch boxes to designers, and a few pillows here and there to magazines. 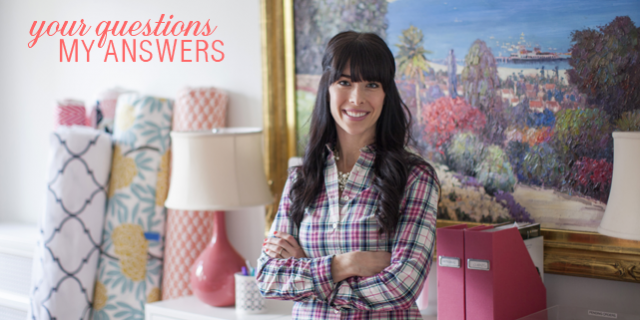 Pinterest came out right before I launched my textiles, so that was huge! Sometimes I feel like I am living in a dream when I see myself in an article but then I remember that I am one tired lady and this has taken a lot of hard work to get here. I absolutely consider social media to be the reason for the success we've had. The internet is such an incredible tool for creative professionals. Designers in the past could only be seen through print magazines and word of mouth. Social media has changed our field drastically allowing us to share ideas and make connections with other creatives and businesses to help each other be seen and succeed. Considering that I am a mom to two little ones, I would not have had the ability to market myself as easily (or really at all) without my blog, pinterest, Instagram, and Facebook. I am amazed at the success we've had in only a year and a half- I feel very blessed to have had such great support from blogs, friends, and other creatives in the industry. I'll be honest and say that I am still in shock at how simple running an online business can be. We have a pretty smooth operation running right out of our home office and I feel very fortunate to be able to raise my kids and run a business all under one roof. I think the most challenging part of running a business is managing people and relationships- whether you work with clients, have employees, and/or deal with tradespeople, they are what matter most. Yes, the internet does a lot of work but when it comes down to it you still need people to have real success. People need to feel valued, understood, and appreciated- so I am constantly learning by experience how to best lead my own team, serve our customers, and strengthen professional relationships. We love how so much of your inspiration comes from other cultures and times in history. You’ve lived in so many culturally diverse and beautiful locations (San Francisco, Paris, Hong Kong, & Dubai to name a few). Many people dream of living abroad but aren't quite sure how or where to begin! Tell us about these experiences - what that process was like from getting a visa, how long you were there, finding somewhere to live, settling in, language barriers, etc.? I grew up in San Francisco, studied abroad in Paris in college and my parents have always traveled so I think being a jet-setter is just in my blood! My husband's company did the leg work for visas which was incredibly helpful but each place we lived brought it's own unique challenges. Whether we stayed for 2 months or 2 years, we still had to set up shop to function as a family in a foreign country. Finding housing that I liked was difficult and each country has it's own quirks when it comes to comfort and standard of living but you can make even a temporary house feel like a home with a few personal touches- like flowers, frames, and of course PILLOWS! Luckily we didn't have too many language issues in Dubai or London but I did have my fair share of experiences getting lost in Hong Kong. My advice is to buy a cell phone, enjoy the local cuisine and shopping, and always have a sense of humor. Give yourself a 2 week settling period when you move to a new place- it will feel strange, very strange at times but within a few weeks your new life will start to feel familiar and it will get easier. My husband and I had so many amazing and hilarious memories together as nomads- I will always cherish the time we had abroad. Just as I like to bring a dynamic aesthetic to a room for my clients, I wanted to create a collection that would help people combine patterns and colors in their own homes with confidence. I carefully designed each mini pillow collection juxtaposing patterns, colors, and scales to create the perfect balance- and at the same time versatile enough to work with a variety of styles. I think of every client project as a big accomplishment because I learn and grow as a designer with each opportunity and feel lucky to be able to do what I love. I guess I would say that my greatest accomplishment would be carrying out the textile line and still continuing to run my design business. Having a multi-faceted business can be overwhelming at times but I thrive under pressure and truly enjoy all aspects of running my business. Lately, I've had design consultations almost every day of the week but I actually prefer to be with my kids for 3 full days of the week and only need a babysitter for 1 or 2 days. I am lucky enough to have a great team, Rachel and Thais who help me immensely so I can pretty much be a mom most of the time. I come into the office for an hour or two a day to work on designs or make important decisions during my kids' nap time! This has worked really well for the last 2 years but as my kids get older, it is getting more difficult so we have plans to get an office space and possibly retail space later this year. Start blogging! Take an accounting class, learn photoshop, make friends with other creatives - and share your talents with others as much as you can. Oh and did I say, start blogging?! Do you do E-design or virtual interior decorating? Unfortunately, my schedule and family life no longer allow me take on virtual decorating projects but my pillow collections allow to you to get my designer touch in your home with the click of a button!